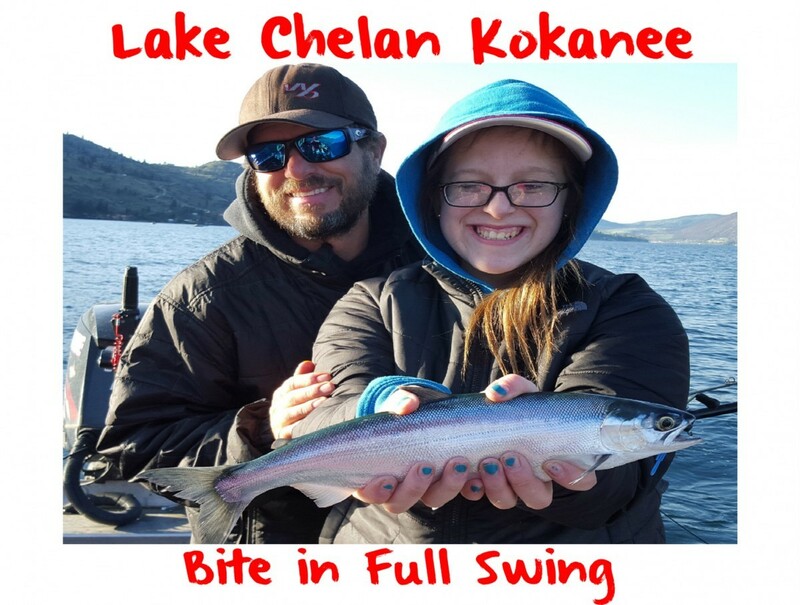 As our cold, snowy North Central Washington winter fades to a blustery spring Lake Chelan’s kokanee fishery is heating up as fast as the air. While we have been making the cold, long boat ride up lake the fish are starting their annual migration down lake to follow the food. Fortunately, those 20-30 minute cold boat rides have been replaced with 5-10 minute rides in balmy conditions. 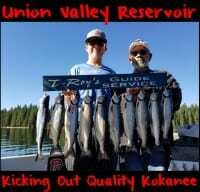 We have been fishing two groups of kokanee. Some of them are 10-12 inch fish, but most are respectable and fat 14-16 inchers. Most of the fish we are finding are on the shallower “ramps” in the morning. This means where you have a steep transition from deep to shallower water. Then the fish move deeper as the day goes on. The fish have been anywhere from 45 to 150 feet deep. I’d recommend looking for fish in that range on your fish finder and once you find them adjust your depth and gear as needed. It’s also important to have lines set prior to trolling through the school. I seldom catch them as I drop or raise my gear. We are running Freedrifter trolling flies and Money Maker hoochies behind Mac’s Lures Double D and Sling Blade dodgers. Oftentimes mid and late morning I switch some gear over to smaller profile stuff like a Bead & Smile Blade or Shaker Wing set ups. I tip all my lures with a piece of my “special” Fire Corn. I usually use one kernel of two different colors. I feel kokanee like the contrast. Foe example, pierce a piece of orange corn on one hook and pink on another. My corn isn’t that “special.” Fire Corn works right out of the jar. 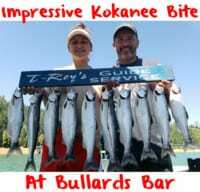 Meanwhile, I tweak it because that’s what us kokanee guys do. There is many colors of Fire Corn. On the other hand, many times I find myself wanting one that isn’t one of the five colors it come in. To remedy this I keep a jar of Natural Fire Corn on the boat and squirt Fire Dye (which is UV) into the jar. It works in minutes. I’ve been using the Orange Fire Dye on the corn often lately. Another thing I like about Fire Corn is that it’s cooked, which makes it drier than canned corn. Therefore, it soaks up and holds extra scent better than canned corn. I will put a few tablespoons of Super Dipping Sauce or Liquid Krill in whatever color I am feeling at the time although krill/anise has been a good scent lately. Editor’s Note: Brad Wagner operates Bobber Down Guide Service. 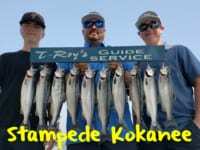 For information on guided Lake Chelan kokanee trips please visit www.fishwenatchee.com or https://www.facebook.com/Bobberdownguideservice.